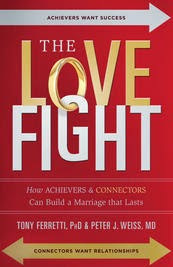 “Will you fight for the relationship or against each other?” that is the question posed by doctors Tony Ferretti and Peter J. Weiss in their book, The Love Fight: How Achievers and Connectors Can Build a Marriage That Lasts. The authors describe the problems and conflicts that arise in relationships between two distinct personality types, Achievers and Connectors. Achievers are focused on success and power. Competitive and controlling, they feel driven to work hard, often prioritizing their careers and accomplishments over relationships with spouses, family, and friends. They may achieve great success in business or politics, yet fail (often repeatedly) at marriage. Connectors focus on the relationships in their lives. They find the greatest meaning in life through their deep bonds with family and friends. Connectors are open about their feelings and empathetic with others. These traits support physical and emotional health. However, Connectors run the risk of becoming overly dependent on others for their self-esteem. When Achievers marry Connectors, as they often do, the stage is set for conflict and disappointment. Despite all their efforts, the Connectors find that they cannot form the kind of deep, meaningful bond they need with their partners. Eventually, they turn away, seeking satisfaction in other kinds of relationships and social activities with their children, family, and friends. The Achievers begin to feel ignored and unappreciated. They are likely to spend even more time pursuing status and recognition, and may end up having affairs in order to soothe their egos. In writing The Love Fight, the authors’ main goal is to reach out to Achievers, helping them to understand why their relationships have fallen apart, and how they can make the necessary changes that will allow them to enjoy the benefits of a healthy marriage. They also speak to Connectors, who also need to understand their mates and address their own contributions to their marital issues. The book uses case studies, self-assessment tools, informative discussions, as well as the authors’ own experiences to systematically and compassionately explain the thinking behind each person’s behavior. They describe how childhood experiences shape our view of ourselves and create our expectations for relationships. Much of the information would be useful, not just for couples in Achiever/Connector relationships, but for any who have experienced conflict and loss of connection in their marriages. Each chapter’s lessons are summarized in a “bottom line” list and a one-line reminder or inspiration. There are guides to falling in love again, rebuilding trust, and moving forward with a new commitment. The authors also acknowledge that not every marriage can be saved, but that it is possible to heal and create a good life after a marriage has ended. The Love Fight is available from Amazon and other online retailers. For additional information, visit the publisher, Florida Hospital Publishing.